On the road to our modern human lineage, scientists speculate there were many twist and turns, evolutionary dead ends, and population bottlenecks along the way. 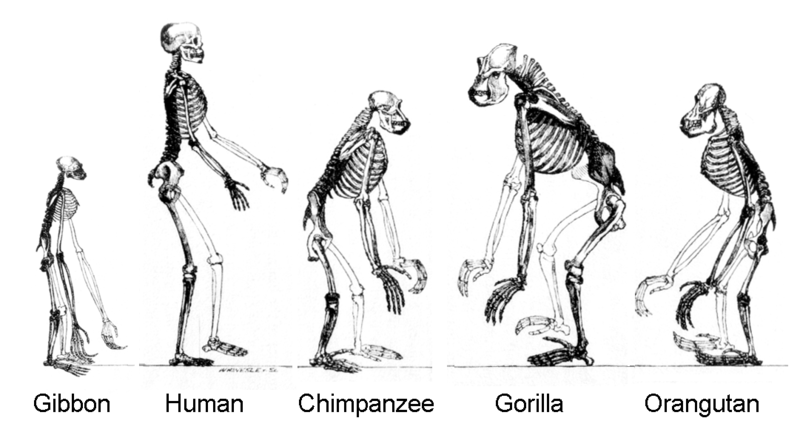 But how large were population sizes of common ancestors of the great apes and humans, and does the genetic analysis support the prevailing views of a great bottleneck in primate evolution? Using inferred evolutionary rates of more than 1400 genes and ancestral generation times, Professor Carlos Schrago and colleagues trace population histories backwards across evolutionary time to estimate population sizes for common ancestors. Their results show that the population sizes of lineages leading to human and chimpanzees dramatically shrunk over evolutionary time, from approximately 1,200,000 in number to 30,000. This population reduction coincides with bio-geographical data that suggests a great ape ancestral migration event from Eurasia to Africa during the late Miocene period, from approximately 12 to 5.5 million years ago, with a five-fold reduction in effective population size between the ancestor of the Eurasian and African great apes and the ancestor of African great apes alone, suggesting that the Homininae diversified after a dispersal event from an Eurasian ancestor. The article appears in the advanced online edition of Molecular Biology and Evolution.